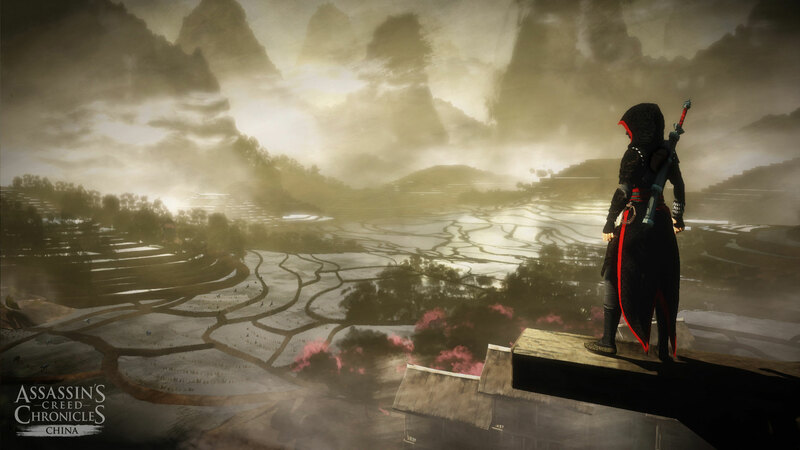 Assassins Creed Chronicles: China, the new addition to the Assassin’s Creed franchise, is a completely new experience in both game-play, strategy and appearance. As a refreshing departure from the main series, we are able to take control of a brand new protagonist, Shao Jun, in a completely different environment and not only does it look good, it also feels fresh and exciting. As most of us will already know, this new Assassins Creed is no longer an open world. We no longer have an objective with multiple routes in which to complete it. As I’ve been playing the series from the start I know that this can be a major part of the experience in other titles and more so in the more recent games. We no longer have the choice of different ways into a forbidden area and secrets that make it rewarding for taking the time when progressing into a mission. We still have a choice in how we approach an area in the game, whether it be quiet, without killing at all or balls to the wall LEEROY JENKINS style! This may take a very big chunk out of what we’ve come to know as the AC way but the new layout lets us explore a more puzzle based route. In my previous experience, on the occasion that I trigger guards, I would simply let a smoke bomb go off and either high tail it to safety or just run towards a target in hope of a cut-scene. In Chronicles, I feel a little more encouraged to let myself fail and go back to the start of the stage and work out the best way to the current goal or target. The way this game looks is a great reason to play it. Chronicles looks, moves and feels like your making you way through a landscape that looks painted in the way of traditional Chinese works of art. They also haven’t let anything in the background go to waste, as the layers of trees and mountains move to give depth to a more or less 2D experience. 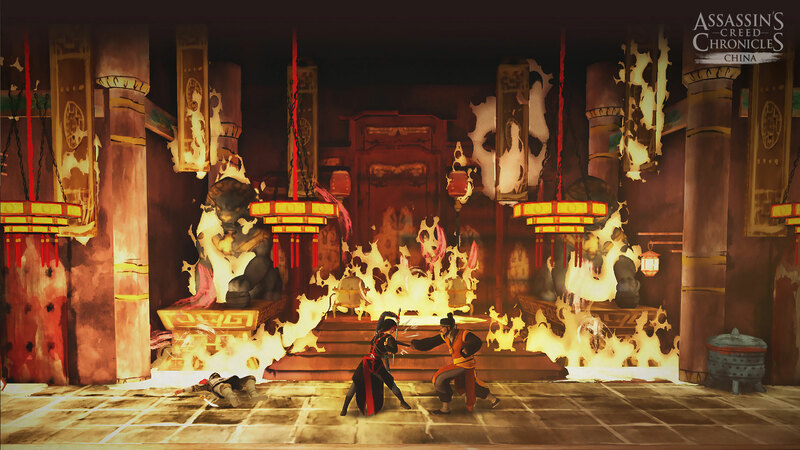 As for the Characters in this game, Shao Jun moves smoothly while the red of her belt glides in the air like the scarf worn by Strider, another side scrolling fighting game. However the way it seems to glide through the air and the way that damage is represented with splashes of red make it look like your painting the picture as well. Another interesting point in this new experience is the few minor changes I think would be greatly benefit the main series of games. The first is Shao’s Eagle Vision. As the game is broken down into smaller areas, we no longer need a map in the bottom of the screen. In Chronicles, Eagle Vision IS our map. We no longer simply unlock a piece in the puzzle, we physically view the area in front of us, which can help us see our route, points of interest, and hiding spots. Other small changes include being able to move within hiding places to cover more ground while still being invisible and we can now assassinate as many guards as we want and place them into the shadows. As many as we want AND in quick succession. Shao Jun, our leading lady in the new story, is also a slight improvement to the franchise as well. I can hardly believe this is the first time we can whistle in this series stealth games but it’s simple and effective in drawing guards away. At the moment all I have is the rope dagger, fire crackers, which are very useful and don’t garner unwanted attention, and the sword but I am a fan of the combat, what I’ve seen of it so far. Just like we’ve seen since Assassin’s Creed 2, our best tactic is to wait to counter then slice at our enemies but you can just keep mashing square and deal some damage. Like I’ve said previously though, this game will encourage you to go back and try again this time without being seen at all. AC Chronicles: China is a great new look at a series that I feel will be improved upon slightly with every release. It takes a franchise we’ve become quite used to makes you look at it in a more puzzle based way and really changes how I for one have played most of the other titles in the AC universe. It is worth noting though that it’s no longer an open world, but then again how could you take a mostly 2D experience and still have a world to explore like previous instalments. It really seems limiting at times but it feels like it has opened a new perspective that I haven’t felt in other games. Yes, other than the choice of stealth or action, there aren’t any other choices in successfully reaching the end of an objective or stage. It’s more puzzle based than we’ve seen before and the world in which we can move around in is limited in comparison. However, this world is beautiful to look at and experience. If you are a fan of the main AC series, I would advise picking this up and giving it a go. 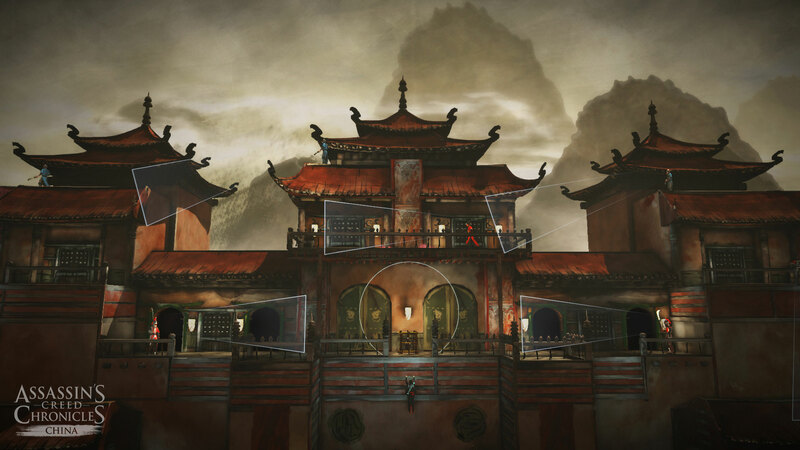 This entry was posted in Uncategorized and tagged Assassins Creed, Assassins Creed Chronicles: China, Ubisoft. Bookmark the permalink.